If romantic red is not your thing, then our next idea could be for you. 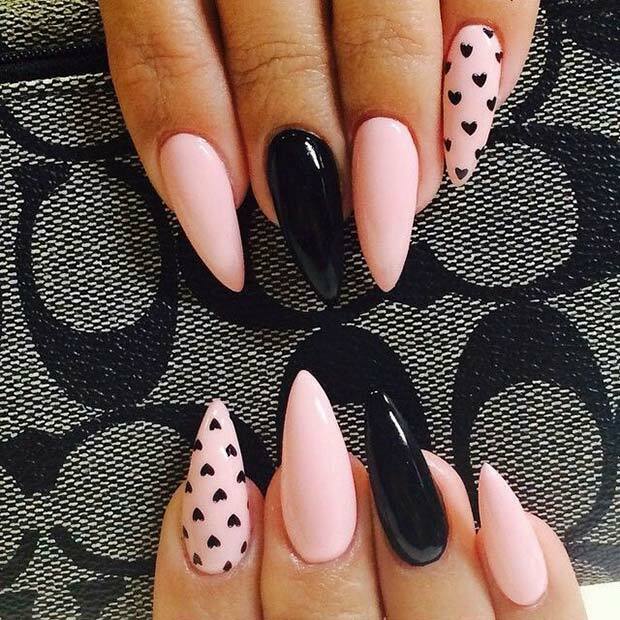 These almond shaped nails have been painted in a light pink and black with a heart accent nail. 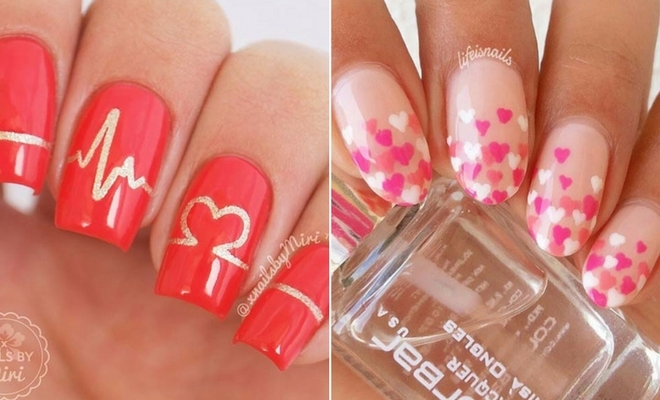 The small hearts could be created with a small, thin brush or even a toothpick so can be done at home. There are tutorials to help you online. Art like this will suit nails in all lengths. Our next idea is very cute and pretty. 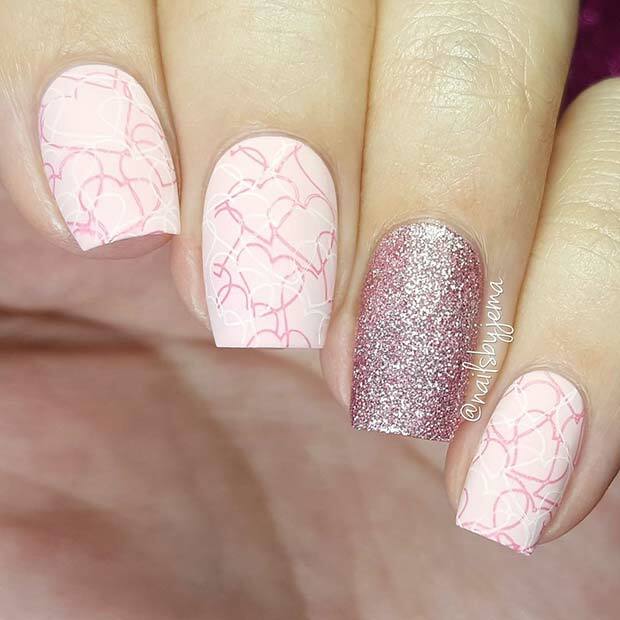 Some of the nails have been decorated in a soft pink glitter while two nails have a heart pattern. You could recreate the whole look or just elements from it. Maybe have the glitter in a shade of your choice and just have the red hearts. You could even have glitter hearts to! We couldn’t have a Valentine’s Day list without having nails in a beautiful pink shade like this one. 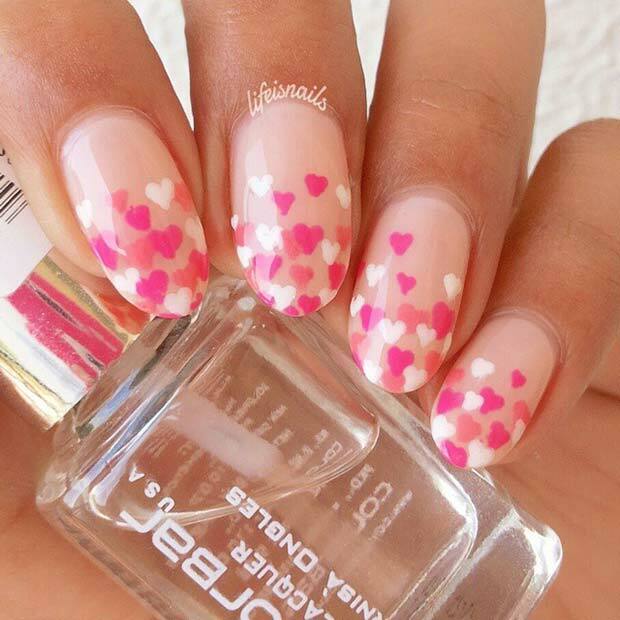 These nails have a main base color of vibrant pink with white hearts and paint splatters. You can get the heart design with a brush or toothpick and the splatter design can be done with a straw. There are tutorials online to help you with both design elements. Heart shaped balloons are a very popular Valentine’s gift, so it is no surprise these treats have inspired nail art. 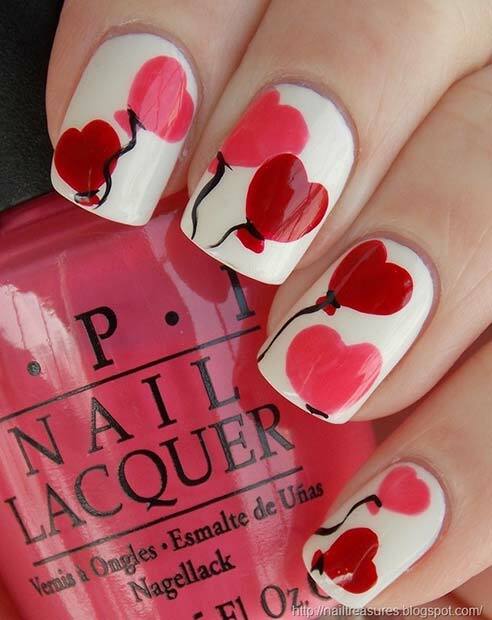 These next idea features white nails with a pink and red heart balloon on each one. You could recreate the design on all nails or just one or two for accent nails. 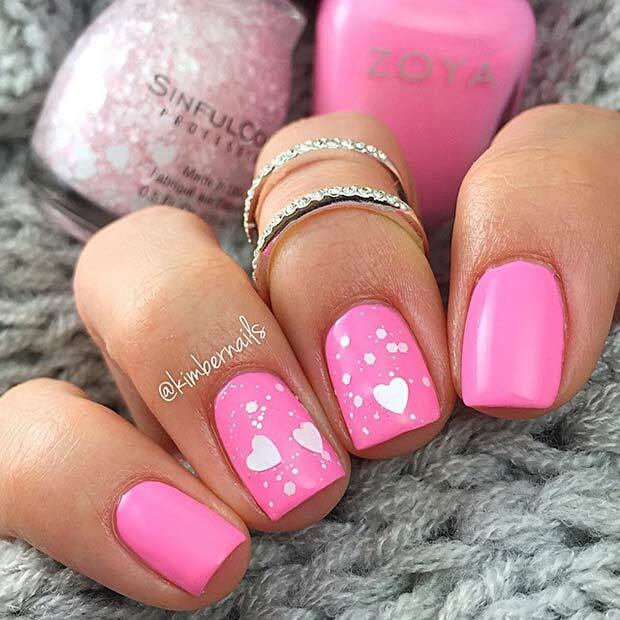 Be pretty in pink this Valentine’s Day with nails like these. One nails is covered in pink glitter while the others have a multi heart design. You can change up the design and just have one heart or try and create lots. Light pink looks cute, but you could also try darker pink shades to. If you want nails that look gorgeous but are easier to create, then this idea could be for you. All you will need is a light pink polish and apply to each nail. Then to create the hearts you will need stencil. Simply paint a darker pink over the stencil. That will be your nails finished. You could create accent nails or put hearts on all of them. Dark has been a must have color of the season. 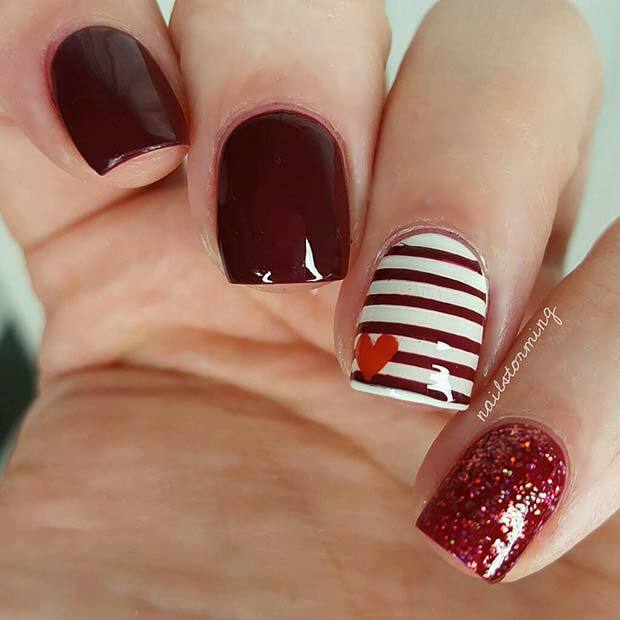 So, why not use dark red for you Valentine’s nails. Not only will your nails be bang on trend but also perfect for the occasion. You could just paint your nails in the red shade or add some nail art like this. 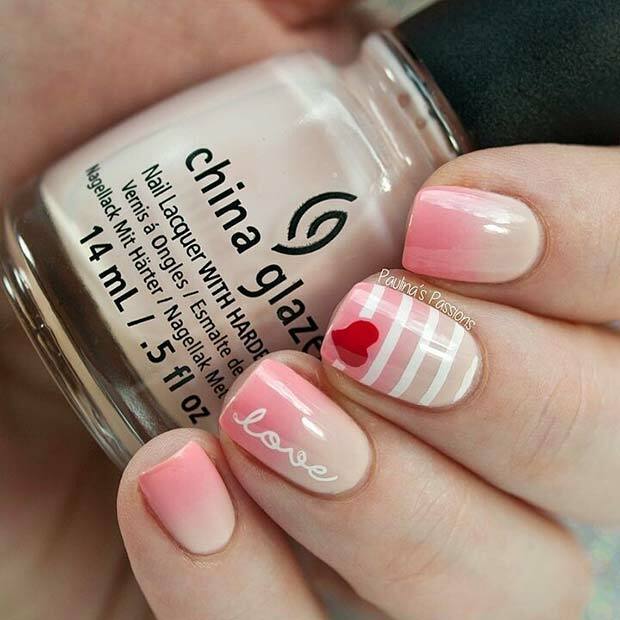 The stripe and heart design is super cute and will suit all nail lengths. If you like the stripe and heart design, then you may like our next idea to. Instead of dark red and white this stripe design uses pink ombre and white. Pink makes the overall look more vibrant and fun. There are tutorials online to help you with the cool ombre effect. Add some glamour to your look with gold glitter designs like these. Glitter goes beautifully with pink, so it is perfect for Valentine’s. You could recreate a similar look with just pink and gold or you could add in the stripe design to. Try to avoid using red and gold glitter as it may look Christmassy. Gold glitter not your thing? Then try silver instead. Silver glitter compliments pink, red and purple beautifully so would suit Valentine’s perfectly. 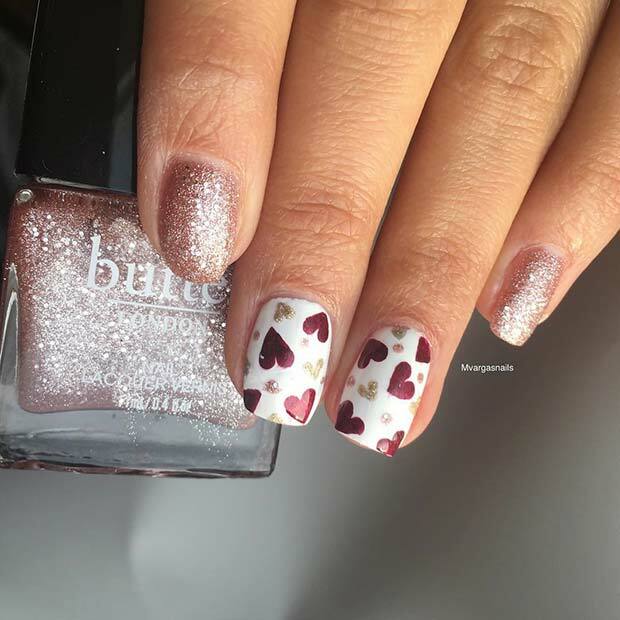 You could use glitter with a cute heart design like this one. All you will need is a stencil, glitter polish, base color, and a polish of your choice for the hearts. It is a super cute design that would suit anyone. 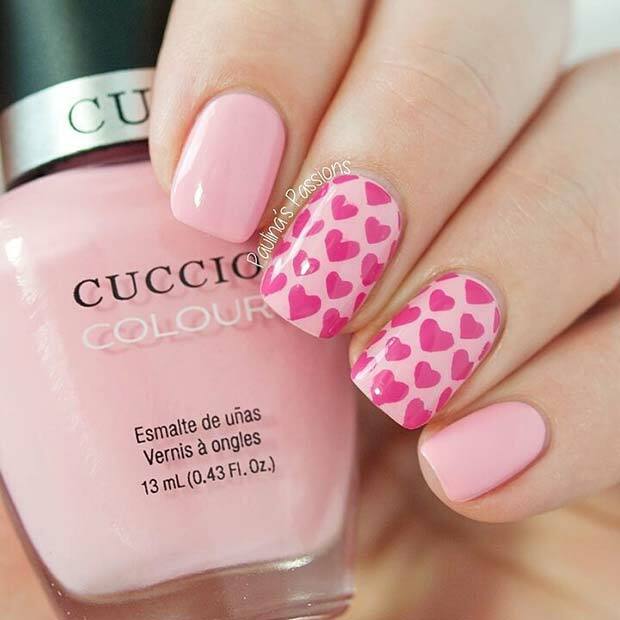 Last on our Valentine’s Day nail list is this beautiful heart design. The long nails have been painted in a natural color and have small multi color hearts on the top. You can use any colors for this, but you will need a stencil to keep the hearts looking neat. Art like this will take some time but it will be worth the effort! We hope you have found the perfect nail design to celebrate Valentine’s Day in style!